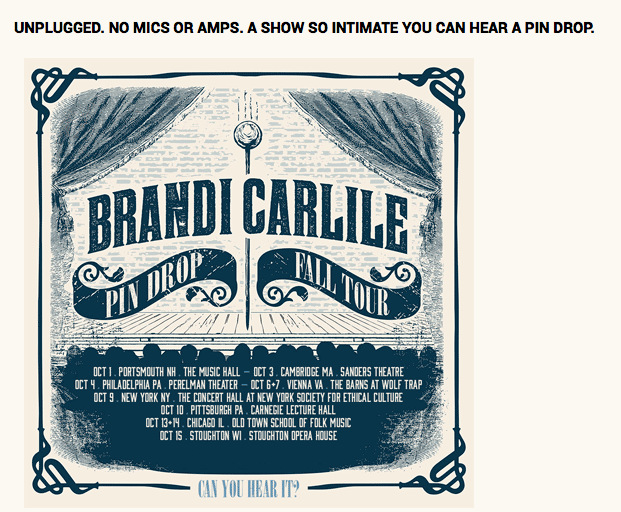 I was sitting in the passenger seat of my friend Rachel’s VW Bug somewhere near Phoenix on a hot summer day in August when my friend Megan texted me about Brandi Carlile’s October Pin Drop Tour. I surely squealed in excitement when I found out that one of only eight venues in the United States that Brandi and the Twins were going to play COMPLETELY UNPLUGGED was The Music Hall in Portsmouth, New Hampshire. My heart soared. Brandi Carlile is one of my most favorites. I first saw her with my friend Kim in 2005 opening for Ray LaMontagne at Berklee in Boston. The last time I saw her was phenomenal—one of the best shows I’ve ever seen. I was in the front row at the State Theatre in Portland, Maine, while Brandi and the Twins belted from just centimeters away. The time I saw them before that, I was also in the very front row at Berklee in Boston. 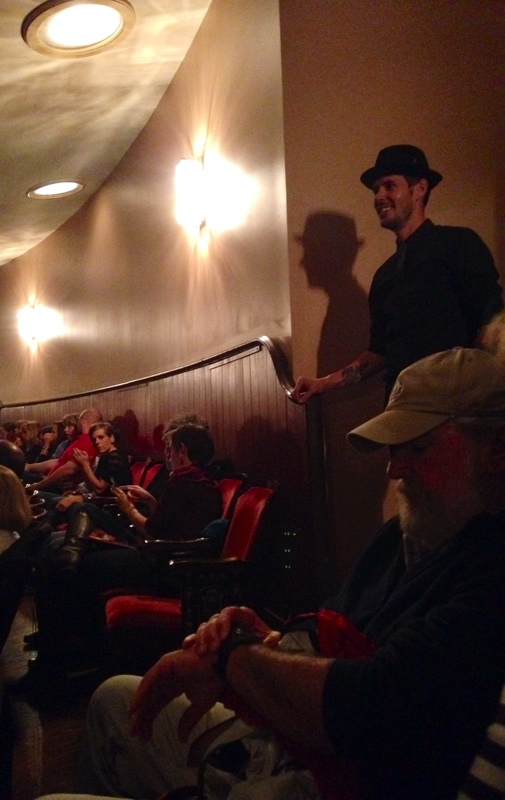 For this show at The Music Hall in Portsmouth, New Hampshire, though, our seats were in the VERY LAST ROW. And it didn’t matter one single bit. This show was magic. This was the third Brandi show Kim, Sarah, Megan, and I have seen together. 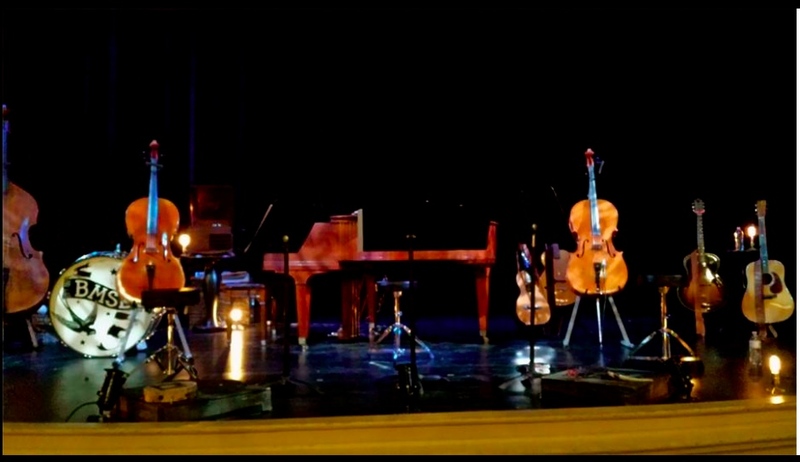 The first was in 2009 when Gregory Alan Isakov opened for Brandi at South Portland High School. We still laugh (but only a little) about how I sat next to a woman in her forties at that show who texted constantly through the first four or five songs until I asked her to put her phone away. My intervention only reduced the frequency of her evil texting to once per song or so. We all went to see Brandi again the following summer at Hampton Beach Casino Ballroom the night before I flew out to visit my friend Brady in Alaska—a beautiful bucket list trip that I didn’t want to come home from. 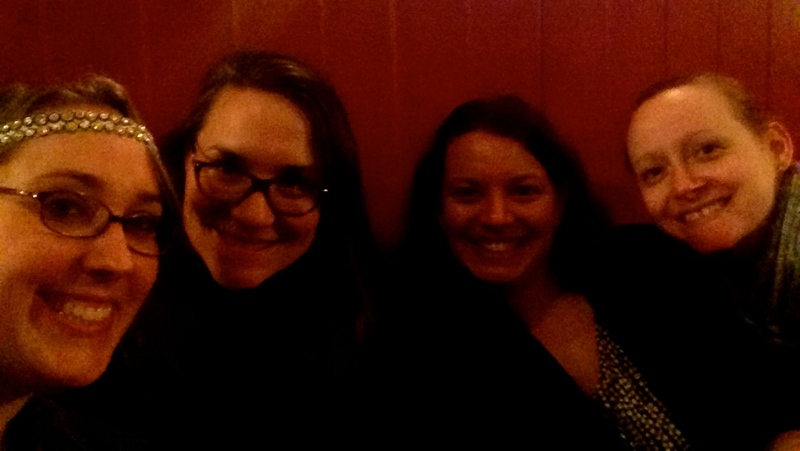 We managed to get four seats together for this show and it was great to spend a little bit of quality time together. I also got to see my concert friend Colin who miraculously had a seat in the second row for a few minutes during intermission. He caught the trio of musicians from Brandi’s band who played covers of popular songs on violin and cello during the opening slot. 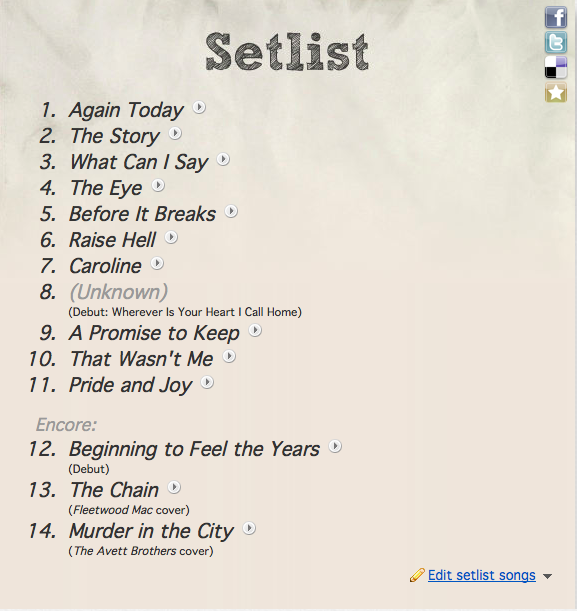 I missed most of their set, but what I heard (including “High & Dry” by Radiohead) was great. I settled into my seat just before intermission ended and Phil Hanseroth, one of the twins, was standing just a few feet away at the back door ready for the show to start. He and I shared a moment where he could see how excited I was and then the lights dimmed and he started singing his way down the aisle to the stage. So sweet to have a moment with Phil before the show! Brandi was thrilled to kick off the pin drop tour with us and was obviously as excited as we were about the concept. We broke out into song during the chorus of “What Can I Say” while Brandi roamed the aisles and sang with us. I loved “The Eye,” a new song inspired by Crosby, Stills & Nash that will be on their upcoming album. The chorus goes—“I wrapped your love around me like a chain/But I never was afraid that it would die/You can dance in a hurricane/But only if you’re standing in the eye.” It’s a haunting song that gave me chills. Brandi’s raspy, soulful voice soared on “Before It Breaks.” I got a little teary during the chorus of that one—“Say it’s over, say I’m dreaming/Say I’m better than you left me/Say you’re sorry, I can take it/Say you’ll wait, say you won’t/Say you love me, say you don’t/I can make my own mistakes/Let it bend before it breaks.” Brandi debuted “Wherever Your Heart Is, I Call Home,” which is a sweet love song. I was sad this night would end before it even began. Brandi was a gracious host and it was such a thrill to have gotten a seat in the sold out Music Hall to be part of it. The last two songs of the night were covers. Brandi and the Twins—Phil and Tim Hanseroth—played an outstanding cover of Fleetwood Mac’s “The Chain.” Brandi talked a little about her wife and their new baby, Evangeline Ruth, and covered “Murder in the City” by The Avett Brothers to sum up how important family is. She and the band recorded it a few days later in Virginia, and it gives you a sense of how intimate the pin drop shows were. 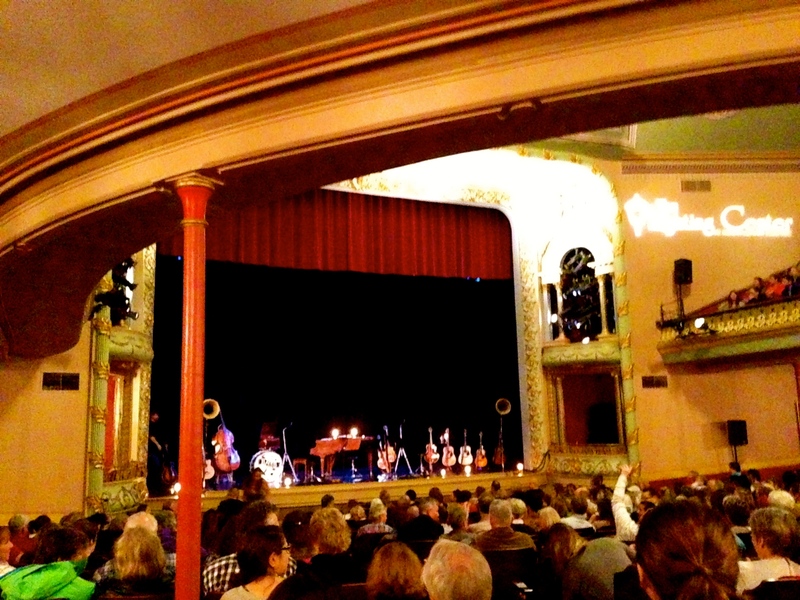 Thank you, Brandi, Tim, Phil, the band, and The Music Hall for a beautiful night. I wish it didn’t have to end. When all the cords and speakers that often help to make shows epic are removed from Brandi Carlile’s stage, two things happen. First, a show is performed with only the essentials: the force of Carlile’s voice, the hum of her many unplugged guitars, the walls of The Music Hall and the many of us lucky enough to be witnesses. And that’s really what being a member of that first pin drop audience felt like. It felt like we were witnessing some sacred creation greater than the sum of its parts. Second, without electric amplification, everyone else’s voices became more useful alongside Brandi’s. So, witnesses though we were, we were not passive but active with a new sort of role to play. We were an intimate band of creative witnesses, the most evocative manifestation of which occurred when, moved by the muse of The Music Hall, we all organically began singing the chorus for “What Can I Say” alternating with Carlile singing the verses while she walked the aisles among us. In this moment I couldn’t tell if I was chilled to the bone or warmed to the core or both! When we remove all the cords and equipment from the stage, the artist becomes even more clearly a conduit for something greater than themselves. With frippery removed so, too was the barrier between the Brandi Carlile and the rest of us. Because she was brave enough to get up there and offer the chance, we all celebrated how unimaginably brilliant hard-working brave human beings can be. Kim made time, too! I’m impressed. These are busy women. But I very much enjoy my “cult of Brandi” with these particular girls. When she played at South Portland High School, we had our first treat of Brandi’s acoustic brilliance. I can still remember the haunting clarity of her voice from the very edge of that high school stage while everyone in the room sat mesmerized. It was enchanting. So the chance to “splurge” on the Pin Drop tour was an easy choice. I left feeling literally buoyant, lifted in mind and spirit as Brandi must have intended when they decided to try this experiment a decade ago. Without amplification, the show had an intense focus that was like nothing I had ever experienced before. I seemed much less distracted by other audience members in the ways that I typically am (the incessant photo/camera screens), people dancing (in or out of their chairs), and just generally the people watching. Here, all eyes and ears were intensely focused on Brandi and the twins. It sounds intense, but it was freeing, particularly in the current era of constant phone dings and pings. It coincidentally synced beautifully with a new commitment in my workplace among colleagues to being more unplugged from our emails in the evening hours. Without working about my iPhone, I was left to just let the experience wash over me. And wash it did. I will forever have an indelible memory of this evening, marked by Brandi’s roaming of the Music Hall for “What Did I Say.” As she walked the aisles in the style of an old-time troubadour, the audience began singing the chorus with her. It was such a powerfully gentle experience, and I found myself *not* singing, but just basking in awe of the moment. A few tears actually rolled down my face (I’m a crier, and this had been a particularly emotional week for me for other reasons). So many coincidences of how this “splurge” came together reminded me deeply of the value of making time for music itself and the community of music in my life, even though I’m not attending as many concerts as I’d like. Thank you, Brandi, for the bravery of the Pin Drop tour. You had precisely your intended effect on me!